Netstor's 750 series is a stylish 4-bay, hot-swappable, SAS/SATA compatible external enclosure. The housing made from an elegant aluminum with anodized surface for maximum cooling and the structure made from heavy duty material for solid protection on disks. 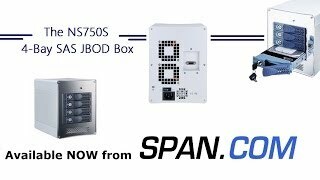 The 750 series is built-in directly SAS/SATA 6.0Gpbs (bacKword with 3.0Gb/s) backplane design with no internal cable for best performance and superior airflow and the host connection is designed with the new interface technology of Multi-lane (SFF8470) in up to 10Gbps bandwidth for 4-disks in single connectivity. If you buy this NetStor 4-Bay SAS JBOD and hard drives we do free build and test for the unit and hard drives. So you can use this device straight out of the box. All free of charge in NS750S price. Do you stock spare caddies for the NetStor 4-Bay SAS JBOD NS750S Desktop Case, quick code 22275? If so, where can I find them to place an order?